When moms begin the homeschool journey, their minds are often full of questions. This is especially true of new Black homeschoolers who have often been disappointed by the traditional school system and who are seeking to create a rich child-friendly learning environment at home. Moms want to know what they should do in order to create a happy homeschool and help their children find success. How should I teach it? How long should I teach it? Should we attend a homeschool cooperative? Should I set up a schooling room at home? Answering questions that begin with the word “should” is often difficult because there isn’t a one size fits all response. But that’s exactly where the beauty of homeschooling begins. As a homeschooling mom, you have control over your child’s learning environment and what you “should” do largely depends on the needs of your child. Every homeschool looks different and that’s a wonderful thing! But in all honesty, there are some things you should do in your homeschool, but they don’t have much to do with curriculum choice, classroom set up, or book lists. Instead, this list of six “shoulds” has everything to do with creating the stimulating and nurturing environment Black homeschoolers need to gain knowledge and confidence. You should follow your state’s homeschool regulations. If you’re unaware of the homeschool regulations in your state, you need to make sure you know them. Your homeschool must comply with the law. Failing to adhere state regulations could threaten your ability to homeschool. You can learn more about your state’s homeschool regulations by checking out this page that tells more about homeschool laws. You should enjoy the time you spend teaching your child. Watching your child learn and being there for the “light bulb on” moments is one of homeschooling’s greatest joys! Children grow up quickly and so it’s imperative that we savor every moment we have with them. The time we spend homeschooling our children should never be looked upon as an unpleasant burden, but rather be viewed as an opportunity to build strong and loving relationships with our children. You should teach your child according to his or her particular learning style. Take the time to read about learning styles. As you study your child and work with him, you’ll soon discover how he best learns. Once you know his style or styles of learning, select educational materials that utilize the style and teach your lessons using that style. For more information about learning styles, check out these three posts: Homeschooling Tactile Learners, Homeschooling Auditory Learners, and Homeschooling Visual Learners. You should teach at a pace that is comfortable for your child. Don’t rush just for the sake of getting done. Learning is meant to be an enjoyable process, one that fosters a desire to learn more. If your daughter needs you to slow down so she can master long division, do it. If your son masters fractions quickly, move on. You have the ability to tailor lessons that will meet your child’s needs. Don’t frustrate your child by moving too quickly or too slowly. You should remember that you are your child’s first and best teacher. You are equipped for this job because you know your child best! As long as you dedicate yourself to better understanding your child, learning the subject matter that is to be taught, and teaching in an effective manner, you can educate your child at home successfully. If you need support in your homeschool journey, connect with other homeschoolers. The African American Homeschool Moms Facebook group is a great place to meet other homeschool moms. You should focus on your homeschool and not another mom’s homeschool. The homeschool community is extremely diverse and learning looks different in each home. Comparing your homeschool to my homeschool is like comparing apples to oranges. The comparison is unequal so it’s best not fall into the comparison trap in the first place. 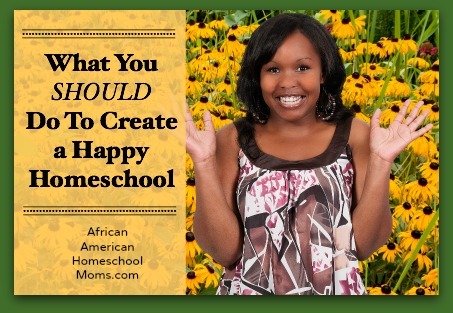 A happy homeschool is simple to create and is not governed by a lot of technical “shoulds”. Stay informed, enjoy the time you spend with your children, focus on your homeschool, and above all…relax!